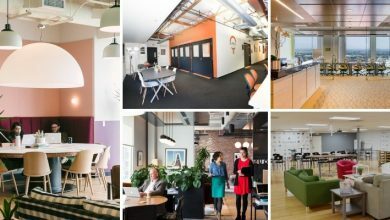 Over the years, Palo Alto has developed a reputation for harboring some of the leading coworking spaces in the world. 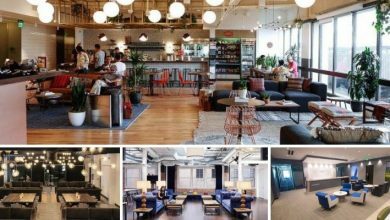 These coworking facilities are striving hard to encourage the growth of flexible work culture. 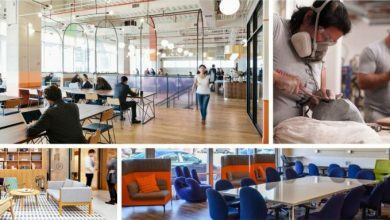 With scores of shared workplaces opening every day, finding a space that suits your requirements can be a tedious task. Therefore, coworking space Palo Alto consists of work centers that cater to the specific needs of an individual. Further, these spaces will give you an opportunity to engage with a community of vibrant industry experts. Every coworking space Palo Alto has something unique to offer to you and your team. Also, they have budget-friendly plans which include additional perks and amenities as well. Want to work alongside legitimate business professionals? Well, you will be in constant touch with some of the great minds. Not to mention, these centers have a meeting and other spaces to help you execute your business operation in a professional manner. 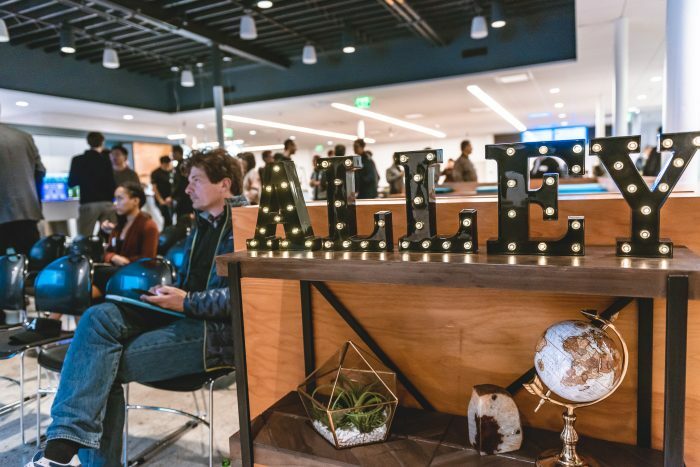 In order to help you choose the best space, we have compiled a list of top coworking space Palo Alto that provides a good working environment. HanaHaus is an exciting place to work, learn and relish a cup of coffee. 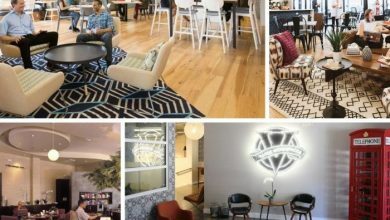 Besides being a community cafe, this Palo Alto coworking space facility that caters to the needs of tech startups. If you are an innovator who likes to experiment with new things, then Hana Haus is the perfect place for you. Further, at this place, you might chance upon an expert who can guide on the right path. Apart from this, the workspace organizes a lot of events with an aim to bring people together so that they are able to network with one another. So, don’t miss out on the chance of experiencing a great work culture at Hana Haus. 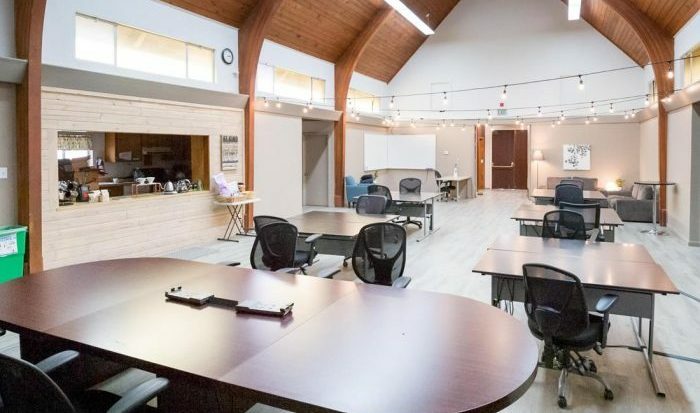 Membership Plans: The membership plans offered by this amazing coworking space Palo Alto comprises of options like open seating, group seating, and private seating. Further, under the open plan seating, you will get a desk located in the center of the workspace at a cost of $3/hour. Similarly, group seating is a semi-private space customized to accommodate 20, 8 or 4 people depending upon the option you choose. They are available at different costs that include $50, $35, $10 and $20 per hour respectively. Apart from this, you can even opt for private work spots which are available at varying costs of $25 and $75. Enerspace coworking Palo Alto is a great place to build connections and take your venture to a whole different level. Working from home can be very distracting and the local cafes are too noisy to work in peace. Therefore, to tackle these problems, Enerspace has designed a place that offers shared desks and private offices in addition to the basic facilities. The workspace is bustling with energetic professionals who understand the importance of creative collaborations. So, if you want your business to thrive, then do consider working at this amazing coworking space Palo Alto. Membership Plans: Enerspace coworking Palo Alto offers three membership options comprising of coworking, dedicated desks, and private offices. The coworking option gives you access to hot desks in the open areas at a cost of $389. Further, the place has communal desks which give you more privacy and can be availed at a cost of $550. Apart from this, the workstation houses big, airy private offices at a cost of $1200. So, you have a variety of options to choose from! Regus Palo Alto is one of the locations of Regus coworking firm which is one of the largest providers of shared workplaces in the world. Moreover, they offer a flexible workspace especially to the business professionals who travel frequently. Here, you will get a hands-on experience regarding how to establish a business and network it in the market. Not to mention the business great facilities provided by the center that help you to perform tasks with ease. 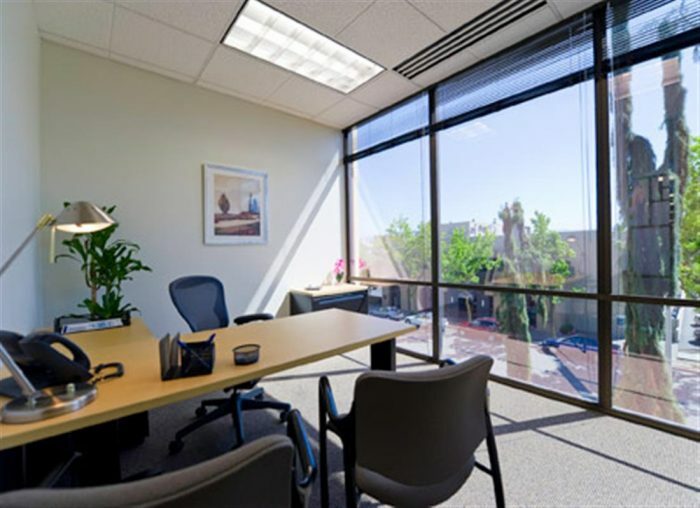 So, if you want to grow your business and meet new connections, then Regus Palo Alto is a great option. Membership Plans: Regus Palo Alto offers flexible membership plans that are tailored to suit your requirements. The options include a business lounge, coworking desks, and private offices. By opting for a business lounge, you can access the lounge area at any Regus center in the world. Whereas, you can also choose to work at a shared desk in the coworking area. Besides this, there are options for well-equipped private offices as well. The workstation also offers virtual office plans with a variety of options. To know about the membership costs, please refer to the website of this coworking space Palo Alto. 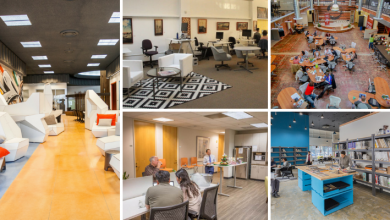 Sandbox Suites Palo Alto is a great coworking space with multiple locations. One of its centers is located in the newly built building on El Camino Real, housing a community of creative professionals and entrepreneurs. Moreover, this space provides a great environment to get work done more productively. Here, you will not be lonely as a lot of people harboring similar aspirations like you drop-in daily to grow their ideas. So, you will get abundant opportunities to meet new people and perhaps even grow your clientele. 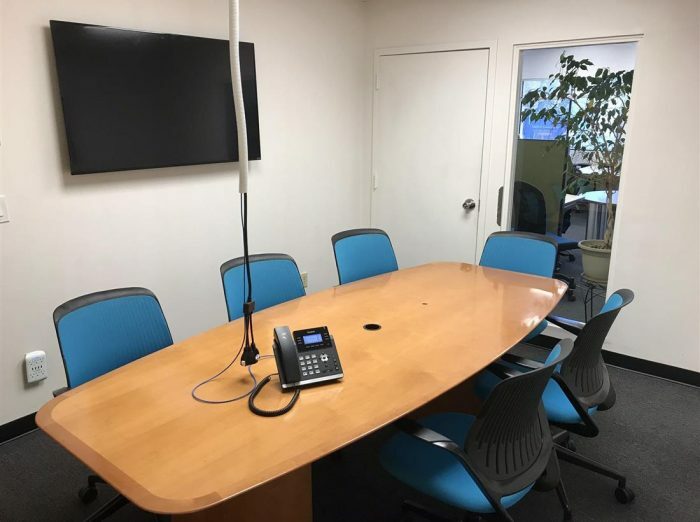 Also, they provide fully-equipped conference rooms wherein you can conduct amazing sessions with your team in this Palo Alto coworking space. 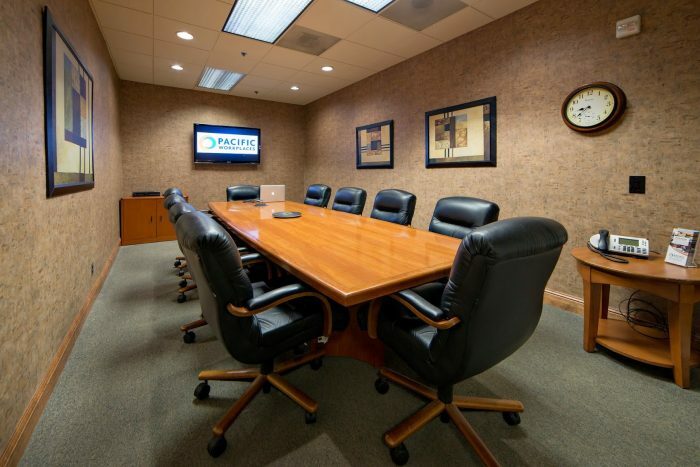 Membership Plans: Sand Suites Palo Alto features a total of 9 spacious private offices, open desks, and virtual offices. Furthermore, the price of the offices varies in accordance with their size and capacity. Other than this, coworking options include private desks and open desks. The former is available at a cost of $495 whereas the latter can be availed at $265. They also offer mail and package handling services under the virtual office plans at a cost of $84. So, choose whatever suits you the best! 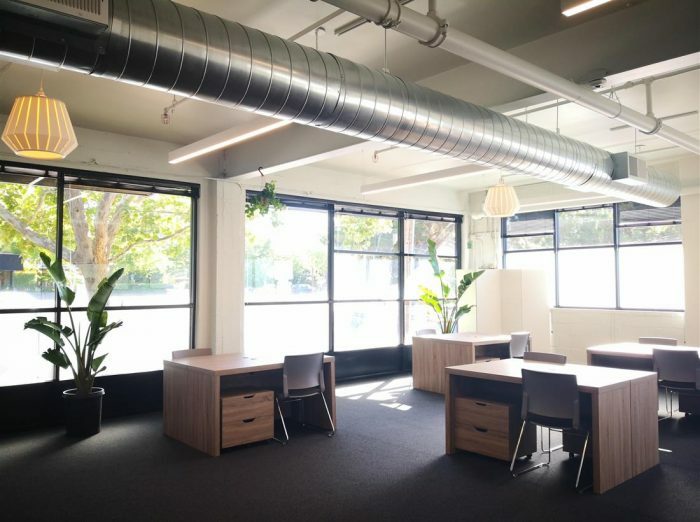 Sacred Space is a vibrant coworking space Palo Alto where you can flourish your business and become a part of a lively community. They offer drop-in work spots for people who require a creative space to achieve their tasks. Apart from this, they offer educational services and daycare facilities. 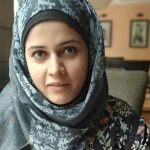 Striving to provide great coworking experience to people from diverse fields, they especially focus on women, artists, entrepreneurs and traditional workers. Also, they provide spacious event spaces in case you are planning to host one in near future. Membership Plans: Sacred Space houses workspaces in the form of a fellowship hall, conference rooms and sanctuary. These rooms are spacious and can accommodate a considerable number of people. Not to mention, these spaces can be customized in whichever way you prefer. To know about the membership costs, please refer to their website. 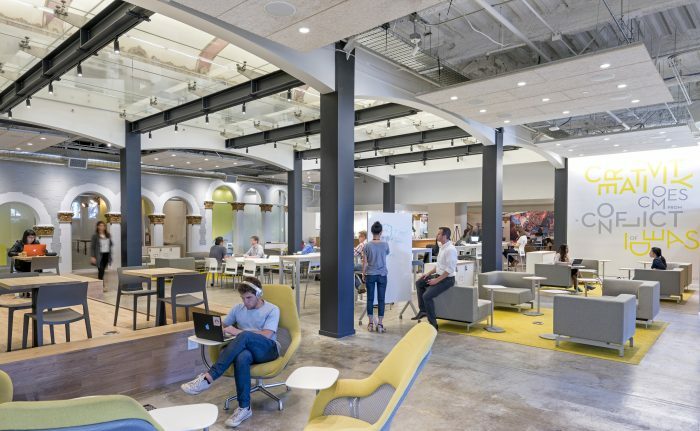 Pacific Workplaces is a large Palo Alto coworking space facility that has its roots in various parts of the world. They offer a variety of services including flexible memberships, mail services and a lot of amenities. If you are looking forward to establishing your venture, then this place might steer you in the right direction. Further, you might chance upon a new idea or partner as you connect with other coworkers. All in all, all that your business needs can be found here! Membership Plans: Pacific Workplaces offers services like full-time offices, coworking desks, and virtual offices. The coworking option includes a day pass ($35), 3-days/month ($69), open coworking ($389) and dedicated desks ($550). Apart from this, they also offer well-furnished private offices to give you a more personalized space to work. You can even get full benefits of the business address of this place without having to actually be there. That is to say, you can apply for a virtual membership that gives you services like call and mail handling. To know about the costs, please contact their team. 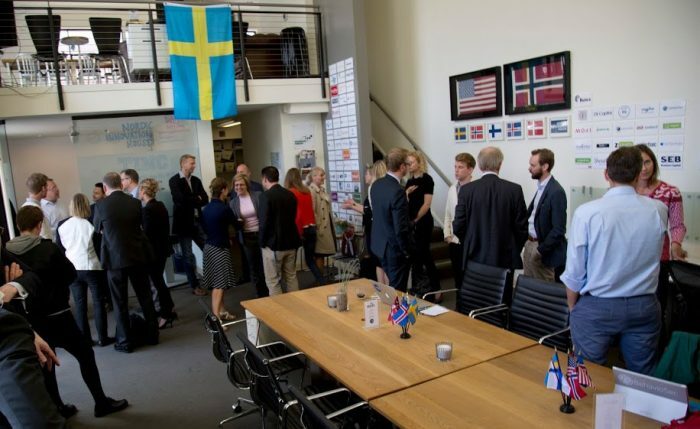 Nordic Innovation House as a coworking space Palo Alto is exclusively designed for Nordic entrepreneurs, small and medium-sized companies who are yet to fully establish themselves. In other words, they give Nordic startups a headstart to secure their position in the market. At this workspace, you have the opportunity to work alongside innovative professionals who harbor big dreams and aspirations just like you! Membership Plans: At Nordic Innovation House, you can gain access to various coworking desks and areas. This is a place to form connections and become a part of the Nordic community. From hot desks to offices, you have a great variety of options at your disposal. To know about the membership prices, kindly get in touch with their team. 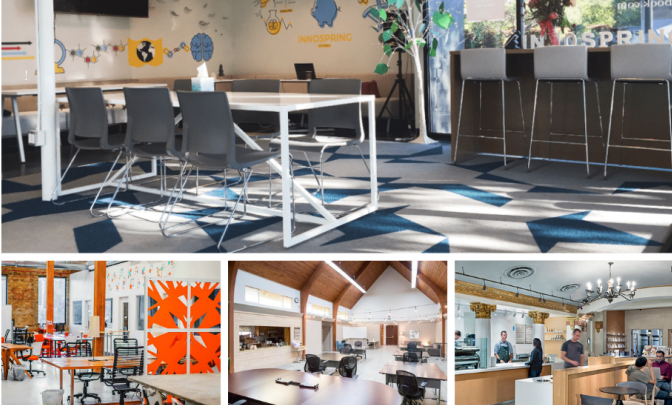 One Piece Work is a great coworking Space Palo Alto firm that supports the community of innovators. They house well-bred mentors who guide the budding professional on the path to success. Furthermore, this workspace has connections with global companies. So, if you are planning to establish your business in the international market, they will help you find investors. Apart from this, you will have ample opportunities to build your own growth network during events and other gatherings. Membership Plans: One Piece Work offers you various options when it comes to accomplishing tasks. You may choose to work in a coworking space with other professionals or opt for a well-contained private office. Apart from these, the workstation houses large conference and meeting halls. In conclusion, you will find here every facility to grow your venture. To procure information regarding the membership prices, please get in touch with their team. 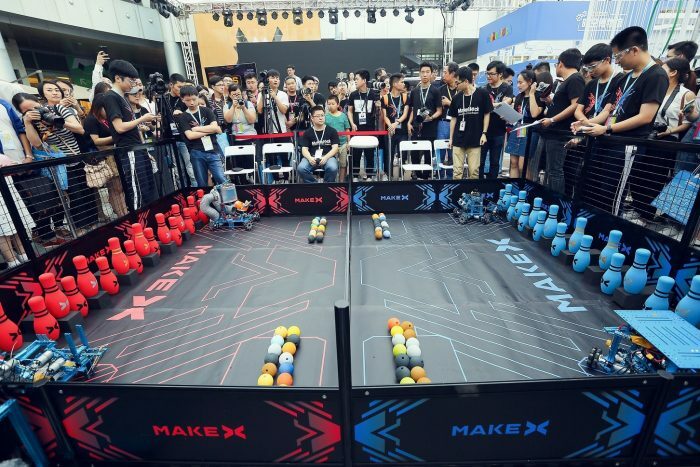 MakeX is a makerspace that provides access to sophisticated tools and equipment. Further, you can learn how to use these tools and software through the guidance of great mentors. Also, you can work on solo projects with the aid of the facilities offered by the center. This Coworking Space Palo Alto is run by a group of teenagers who have `earned mastery over the use of advanced tools. They will guide you as you work on your projects and ideas. Not to mention, you can avail the facilities of this center at zero cost! So, create the masterpiece you have always dreamed of. Membership Plans: Make X is a student-run organization that offers free access to the workspace. In addition, you can use the equipment available at the center for free of cost. The high-school mentors can help you design your projects with the aid of modern tools. Sounds amazing, right? You can make full use of the resources they have. BootUP Ventures is a creative coworking space in Palo Alto for startups and budding professionals. This workspace has secured its position in various parts of the world. Moreover, this space organizes a variety of programs that can help you accelerate your business. The enthusiastic community of professionals belonging to different backgrounds will help you learn new things. So, you will have a chance to acquire plenty of knowledge regarding several aspects of the business world. Membership Plans: At BootUP Ventures, you have multiple coworking options including flexible desks, dedicated desks, and private offices. By opting for the option of flexible desks at a cost of $349/month, you can choose any desk of your liking in the coworking zone. Also, you do not need to opt for a desk in advance as you have the liberty to do so whenever you drop-in for work. The other coworking option is that of dedicated desks wherein you will be assigned a fixed spot to work. Further, you will have 24/7 access to your work spot and the membership price of availing this option is $499/month. Lastly, you have the choice of hiring a private office where you can experience the best of both worlds. These well-furnished offices are available at a cost of $2900+/month. 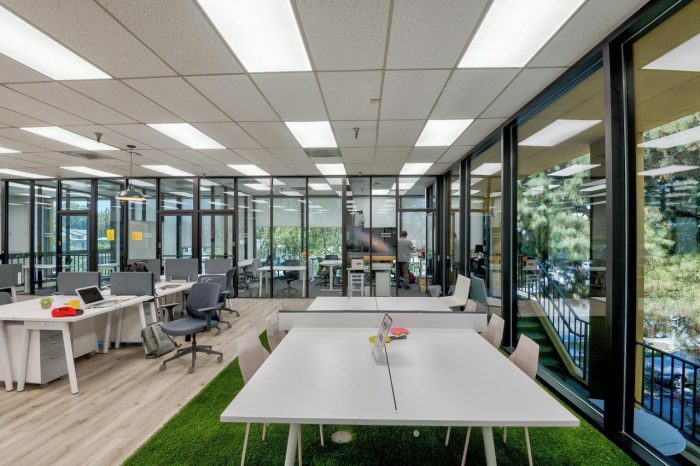 Inno Spring is a Palo Alto coworking Space that offers its tenants with diverse workplace options. Further, this facility is working towards the development of tech startups who are struggling to establish themselves. Here, you have the chance to explore the benefits of working in a collaborative community. Moreover, Inno Spring offers basic amenities that will aid the growth of your business. Membership Plans: At Inno Spring, you can choose to work in the coworking area at a cost of $249. This center also offers the option of virtual office plans which can be availed at the price of $99. Want to hold meetings in a professional environment? No problem! At this workspace, you can either opt for a small meeting room ($25/hr) or a larger one ($45/hr). Additionally, you can book the space for your events at a cost of $1,500 for 2 hours. Alley Verizon is 5G powered. It is a coworking community that offers its tenants a workspace to discover the benefits of working collaboratively. Here, you will learn about the revolutionary ways of getting your work done. In addition, you will be working closely with a crowd filled with budding professionals. They also offer a list of amenities to make your work easier to accomplish. It is not just any ordinary coworking space Palo Alto, it is a place that will transform your dreams into reality! Membership Plans: Alley Verizon offers you with flexible membership plans. That is to say, you have a variety of options to choose from. This includes shared desks, dedicated desks, and private offices. The shared desks in the open area are ideal for solo workers and freelancers who can drop in whenever they feel like working. Further, this option is available at a cost of $475. Similarly, dedicated desks are more suitable for teams who prefer working at fixed spots. The price associated with this option is $550. The center houses large private offices as well which are available at a price of $800. 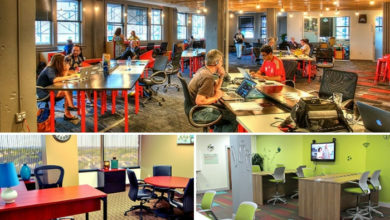 These coworking space Palo Alto listed above are amongst the leading facilities around the globe. Besides offering a space to work, they provide you with numerous opportunities to accelerate the growth of your venture. Not to mention, the bundle of amenities offered by them in addition to the flexible membership plans. These workspaces will give you a great coworking experience wherein you will learn the importance of creative collaboration and developing networks. Also, these workstations are situated in amazing locations within Palo Alto and are ideally suited for executing diverse business operations. Now you have a list of the best spaces within the region of Palo Alto at your disposal. So, what are you waiting for? Go and take a tour of the most suitable option and experience the difference. Happy coworking!